Are you prioritizing portability for beginner video blogging? Or are you an enthusiasts who wants better video quality? 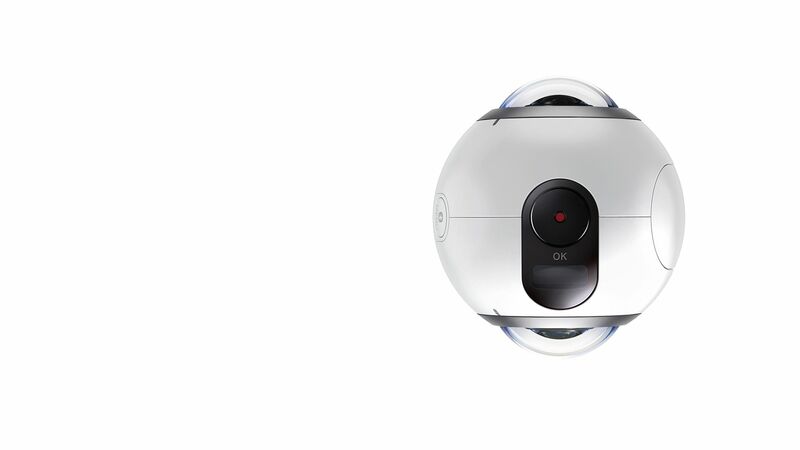 Here’s a 360 Video Camera for you. Why do 360 Video Recording? It’s all over the place now. 360 videos are on Youtube and Facebook, two of the most popular content sharing sites for 360 videos. You may have done it yourself before. During your vacation or maybe just a party you want to share to your friends via VR. Whatever the case may be, 360 video cameras are going mainstream and consumers should choose wisely what they should get. So basically, with a virtual reality camera, you will be able to shoot videos not just on one plane at a time but the entire 360 angle around the camera. This gives you a 360 degree videosphere which you can watch on a virtual reality headset (for full immersion) or just a regular flat screen monitor. This is all good proposition, but what is the best device to do this? The quick answer is: there’s no one best device for all people. Newbies to this new type of content creation may just want some basic features included with their cameras. Enthusiasts may want something more capable but with some affordability. Professionals may opt out for more expensive, reliable and advanced rigs to fulfill their needs and get the job done. In this guide, you will be able to determine what’s best for you and what type of camera is suited for your needs. Does this experience really need to be immersive? Will it be worth shooting at all? Or will a conventional 2D video do just fine? How will the content be delivered and experienced? Will it be shown via a virtual reality headset or via social media? What are my budgetary and production constraints? Will you be spending a lot? Can you afford your choices? This is for the newbs of the virtual camera or in videography in general. These are the people with no professional background in film making and just casually shoots video for their personal collections. In this tier, the Samsung Gear 360 or the Ricoh Theta S are great options. These devices can be bought anywhere for under $400. With a dual lens design that faces on two opposite directions, these are consumer-friendly, super portable and can be controlled using smartphone apps to preview footage right after it is taken. The Ricoh Theta S can do livestream as well, so there you go. These cameras offer lower resolution than the more high-end options, but if you’re a consumer or even a professional just dabbling in VR for the first time, these are solid yet affordable options to help give you the lay of the land before making a larger investment. Even more experienced professionals shouldn’t overlook these cameras, they’re great to have on hand for proof of concept, scouting, and pre-visualization. The Samsung Gear 360 is the best option for capturing 360 video because of its easy operation and lower price tag. Slightly higher than the beginner range, the GoPro Omni is a great choice. For just $5000, it has 6 GoPro Hero4 Black action cameras shooting video in synchronized manner using software. With the price of each GoPro, the price can justify it. 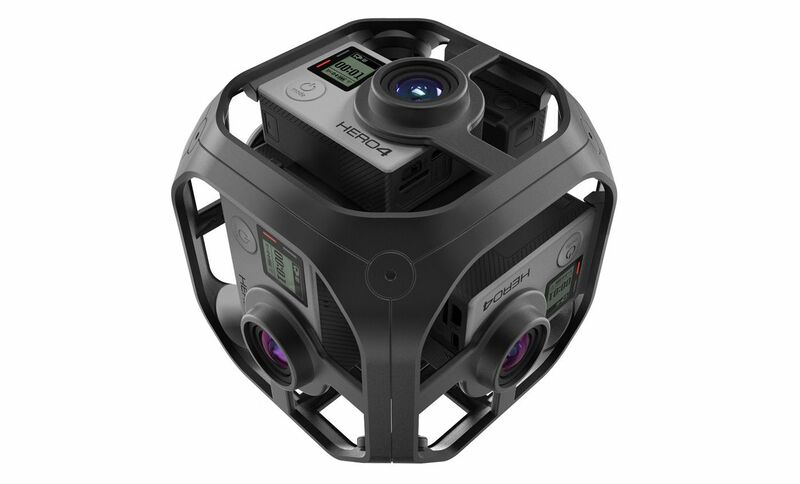 It is in encased in a fairly portable cube like structure and captures the entire scene in 8K resolution. For the editing, GoPro includes their GoPro Kolor software for users to import, stitch, view or even publish their video footages. The Omni has some drawbacks, notably, no live preview or real time stitching. But combined with a Ricoh Theta S or Samsung Gear 360 you can still get quick on-set previews. The Omni remains the first choice in this price range because it provides a one stop-shop for VR at high resolution. And at the size of a grapefruit, it gives filmmakers a lot more freedom and flexibility on set than they might have with a larger custom rig. The GoPro Omni uses 6 GoPro Hero action cam and proprietary software to stitch the different files into a gorgeous 360 video render. This is professional territory so devices in this range are not for the faint of heart. If you’re one of the lucky ones who are adept and very skilled in producing film and video, then the Nokia OZO is your best bet. This is designed for the professionals who want to expand their expertise in VR production. 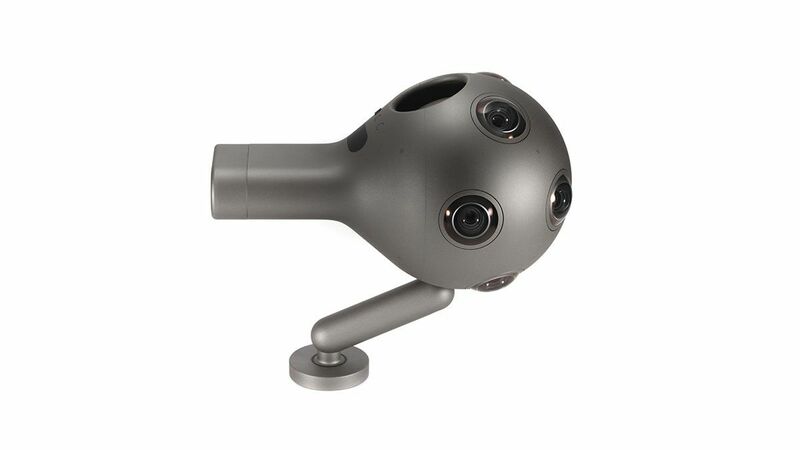 The Ozo is just one rigid spherical camera iwth eight synchronized sensors. So it still stitches various clips to form a genuine 360 video. It comes with its own standalone computer with the Ozo software for live stitching and previewing. It can do ambisonic sound recording, partial stereo and can do live stream in HD resolution. Maximum video capture resolution? 6K. The Ozo costs about $45,000 to buy or $3,000 per day to rent—nothing to sneeze at—but it does provide significant perks and a well-designed end-to-end workflow. Professionals looking for a robust, self-contained production pipeline, or who need to live stream at high resolution, should give the Ozo a try. The Nokia Ozo can do more than just sharp video capture, it does audio just as well. If everything else in the previous sections just can’t satisfy your vision of what you really want to achieve, then it’s high time to create your own powerful camera rig. 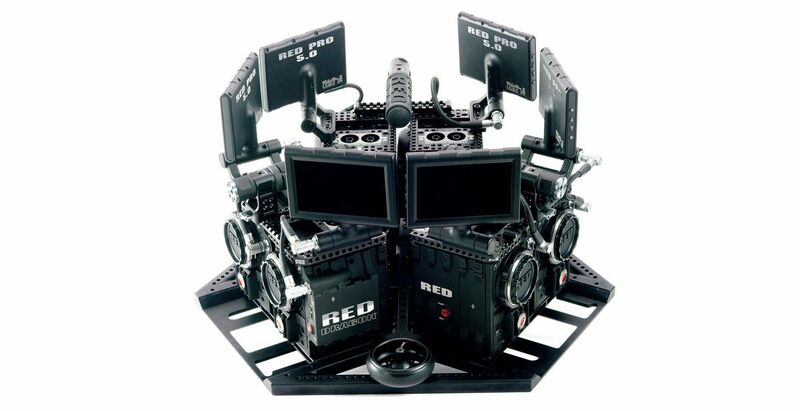 For the filmmakers who want to shoot in 360 with Hollywood quality, then by all means try the 5 RED weapon cameras rigged together to capture videos of up to 10K resolution in 60fps. This is extreme but it can be useful for those who want to show off their footage via virtual reality headsets. The image remains clear and crisp. You can also have the freedom to manually change settings, lenses, modify the angle, do some post-production editing just to get that perfect render of your creative vision. Though the rig delivered, it was large and cumbersome to move around on set, and was more complicated to use than an ordinary VR camera. Even seasoned pros should make sure their shoot is very well planned and really needs to meet certain requirements before experimenting with custom rigs. For the camera crew who wants no compromises on the quality of the end render, a bunch of RED Weapon cine camera is the best it could be.